Shopping for Trolls Creative Toys? Hair, hair everywhere! Create your own colortastic hairstyles for Trolls movie superstars Poppy and Branch. To get started, place Branch or Poppy in the chair, then press down to grow out Play-Doh hair! Shape and style your hairdo with the book-mold, and create colorful accessories with the half-molds. Use the scissors to cut it all off and start over again. 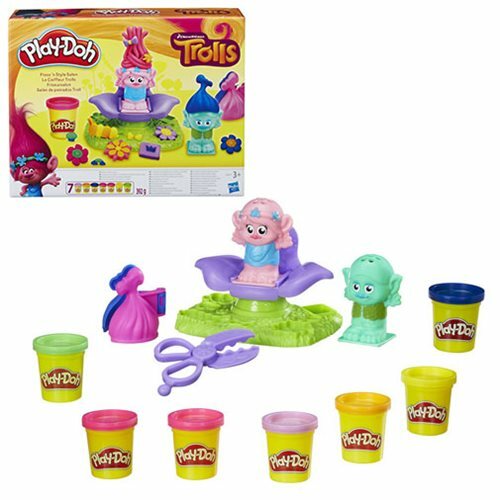 When the styles are complete, the Mr. Dinkles stamper shapes a Play-Doh cupcake treat!Includes Branch and Poppy figures, chair and base, Mr. Dinkles stamper, scissors, and 4 standard cans of Play-Doh Brand Modeling Compound. Ages 3 and up.